Marcel Lüske, also known as “The Flying Dutchman,” is one of the most entertaining famous poker player personalities. He sings at the poker table, wears upside-down sunglasses, and is always wearing a suit at the table. He was born in the Netherlands on March 23,1953, and still lives in Amsterdam today. Marcel Lüske quit his job as a salesman on the first day of 2003, in order to play poker full-time. He doesn’t yet have a World Series of Poker bracelet, but he has come close several times. He finished 14th at the 2003 World Series of Poker Main Event and 10th at the Main Event in 2004, one spot short of the final table. 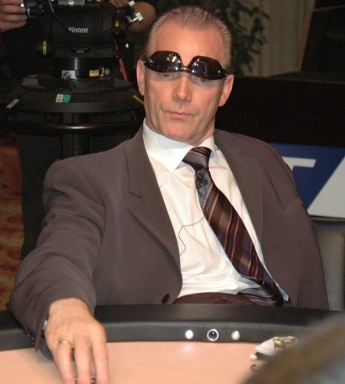 The only player who had a more impressive run in those two years was “Action” Dan Harrington who made the final table both times and eliminated Marcel in 2004. Marcel Lüske also has a 2nd place finish at the $5000 Seven Card Stud event where he was defeated by Joe Awada. Marcel Lüske has been named the European Poker Awards Player of the Year two times, having earned the honor in 2001 and 2004. In 2005 Marcel predicted correctly that Rob Hollink would win the European Poker Tour Grand Final. The next year Marcel finished 7th in the same event. Marcel Lüske won the €10,000 Hall of Fame Poker Classic, winning €119,000 at this event which was held in Paris in July 2005. At the time of writing this, (2013), Marcel Lüske has made a little over 4.2 million in his poker career and his main ambition is to win the World Series of Poker Main Event. Marcel Lüske enjoys mentoring young poker players. He was a mentor to David Williams, the second place finisher at the 2004 WSOP Main Event, and he was a mentor to Kirill Gerasimov, who finished second in the WPT Season 1 Championship. You also don’t want to pick a fight with Marcel Lüske, as he holds a black belt in karate.